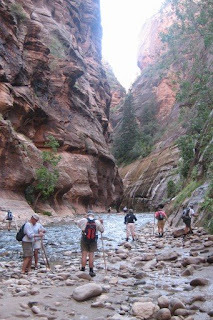 Today the entire "crew" (actually, having hiked it several years earlier JoAnne has opted to stay back and keep Sandy company), has decided to hike the "Narrows" - this is a hike down the Virgin River in a very high and narrow canyon. On Sunday afternoon, we stopped at an outfitter in Springdale to get "water boots" and hiking sticks. 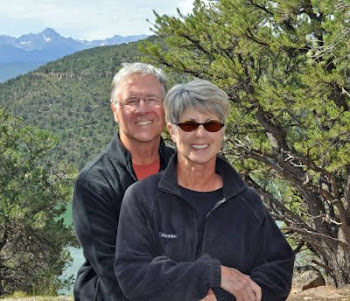 So, early Monday morning we were off to the river and our adventure down the Narrows Canyon. The River was low but the rocks still slippery. Yet, none of us found ourselves up to our neck in water - and that is a good thing. We had a great 5 hour trek and the canyon was spectacular (have you noticed we use that word a lot?). Dinner that night was hamburgers and hot dogs at the Leslie campsite. Another campfire compliments of Hal and Marshmallows compliments of JoAnne.